My youngest son has a good football coach—maybe one of the best around. He’s tough and fair and he wins games, they say. He talks to his players off the field, giving advice I feel comfortable with. I feel fortunate, blessed even. Football is disproportionately important in my house. Coaches are elevated to positions of great status and thus great influence. I never coached a sport, though I ref’ed a softball game once. I played softball, so—in a pinch— I thought I could help the school at which I taught. But it was, without a doubt, the worst officiating ever to have taken place on a middle school field. Trust me, I’m not exaggerating. The best I could do was to try to make equally bad calls on both teams, not giving either side an advantage, but—honestly—someone should have yanked me from that game. Maybe pressed charges against me. I was lucky. Twenty years ago, as a new teacher with a good relationship with my students, I was forgiven. Now, more than ever, we expect much from the adults in our kids’ sports programs, and especially from their coaches. Perhaps we even hope they will teach our kids things that we haven’t. We want our coaches to be tough and firm so that our kids learn to be driven and to develop a sense of earned accomplishment. We want our coaches to teach our kids to set goals and then find ways to achieve them—to meet challenges head on. Yet, as parents, sometimes we take on our kids’ challenges, smoothing their way, making their lives easier—as though we don’t actually want our children to learn to face adversity. For example, we want them to be given playing time. 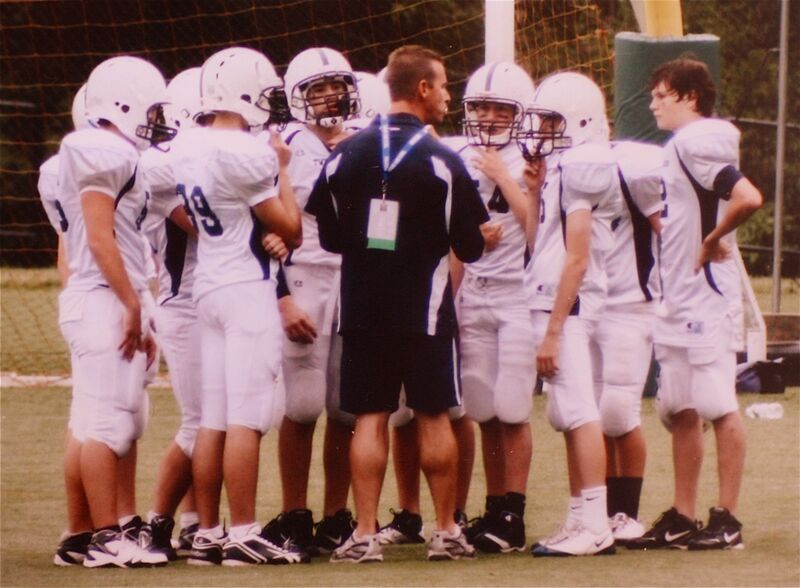 In eighth grade, my older son stood on the sideline for an entire football season—if you don’t count the few minutes of play at the end of a handful of games in which there was absolutely nothing he could do to screw up the score (which he probably would have done if given the chance). His father told him that he needed to prove himself in those two or three plays he got—and I recall the futility my son felt over trying to prove something in a game that no longer mattered against players who went largely unwatched. It bothered me—not because I was living vicariously or had aspirations of recruitment or wanted him to be a stud. It bothered me because I felt bad for him. I want the world to be warm and wonderful and welcoming to every kid everywhere. I didn’t complain about it, but I did my share of hand wringing—hopefully out of sight of my son. Of course, I wanted more than playing time for my son—and I bet you do too. We want coaches to teach responsibility, even as we drive forgotten equipment to school, even as we stay up late to wash uniforms, to pack food, and to ask about assignments. And, parents want their kids on teams with players who are skilled, well conditioned, and committed—who have prioritized their team over all others—yet sometimes we fill our children’s schedules with competing events. Seems like we want our coaches to do better than we have— oh, and we also want them to win games. My son’s former coach—the one who preceded the current staff—didn’t get those wins. Did this result from his play calling or bad luck or a difficult schedule or personnel? I honestly don’t care. I know that he is a good man who did good things for my sons and yet who—perhaps—fell short on some component of the coaching equation. I’ve been a crutch, I’ve been short sighted, and I’ve been caught up on the moment. I may not have yelled at refs, or even at my son, but I’ve done my share of enabling. I’m hopeful that the things this coach did for my sons during some of the most formative and thus difficult years of their lives will remain with them forever, and thus act as an antidote to the hang-wringing that marks too much of my mothering. I am a reluctant football mother, yet one who understands the sport’s value, and the value of its coaches. My older son eventually got off that bench, proved himself, and went on to a short college career in football, ended after a knee injury. Most importantly, my sons learned something about life from a man who cared deeply for them and who might have provided some balance in my parenting—an unlikely partnership that ultimately made my sons better men…even if the record didn’t always prove it. Just wanted to say: A great article — lots of insight, and beautifully written. When I tried to post this as a comment or even a “like” got an “oops – can’t find that page flag. But wanted you to know — a thumbs up. Thanks for your comment, Laura! We probably all agree with the church sign you quoted, but—jeez—it’s hard to do sometimes. I remember my older son worked on a paper FOREVER, gave it everything he had—as a dyslexic, he always had to put in way more effort than my other kids. Of course, he forgot it (he’s also ADD). I received a phone call. “Where are you?” I asked, confused by the noises and the whispering and the time of day. Nice post! Responding to decisions a coach makes takes great diplomatic skills! I clearly didn’t have those skills when I hollered to my son’s wrestling coach, “What the hell are you doing?”(after he was paired with a wrestler much better and bigger than him and my son’s arm was practically ripped out of the socket) Or when an entire gym could hear me scream, “Is that allowed?” (my son was put in the banana split position possibly affecting his ability to have children later in life!) Ahhh, wrestling…the sport that made my heart race, my stomach ache and aggravated my migraines! Oh, I feel your pain. I bet you watched an arm bar. You trust that the ref is going to stop the move before the arm is raised above 90 degrees, but every now and then you get one of those refs who seems a little slow to react. My younger son likes to ride legs so he likes splits, double grapes, guillotine, all those moves….which are awesome when you’re on top. Tim talks about the relief he feels when he slips that leg in. At that point, he can go to work. In my opinion, when we ask kids to put aside their personel goals for the greater good of a team we’re asking kids to remember that life is not all about them—whether as a spouse, a parent, a friend, an employee, or pretty much any type of relationship there are times when we need to set aside our selves for the good of others. There are plenty of exceptions to what I just said (safety issues being the most obvious and important) and wrestling is not a perfect analogy to life…but I think that it can provide teachable moments. And honing our diplomatic skills may be our biggest challenge and greatest lesson! Thanks for your comment, Naomi! I’m finally getting to this although this post appeared in my email awhile ago, but then disappeared when I logged onto the blog. Great post. A good coach is a goldmine. My brother-in-law coaches softball and he’s so wonderful. He coaches my niece’s team! He’s tough but fair–two great qualities. I can so understand the hand-wringing. You hate to see your children hurt. It’s so difficult to watch others’ contributions to the shaping of the children in our lives, isn’t it? We want to shield them from hurt, though we ourselves weren’t shielded. But having gone through the pain, we wouldn’t wish it on them. Still so much of our character is born through pain.